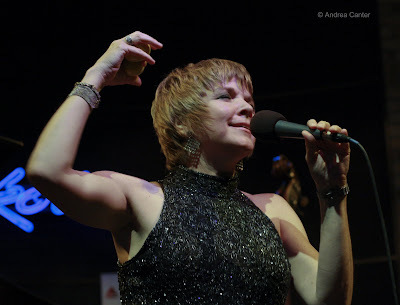 I recall that the last time Karrin Allyson performed at the Dakota in April 2008, I thought it was the best set I had heard from her yet, and that was certainly saying something given her long history of engaging performances. But now, her opening set on Tuesday was surely the best I have heard from her yet. I don’t think I am losing my powers of discrimination or succumbing to the “halo effect.” I think, as good as she is, she just keeps moving forward. And regardless of material—in advance celebration of the release of her Best of Karrin Allyson on Concord, Karrin’s set covered familiar selections from her diverse repertoire, nothing we had not heard before, yet everything sounded as if she was giving it an inaugural performance. And of course that is the hallmark of a top artist. She’ll undoubtedly return next year. Undoubtedly I will repeat myself. Make that the St Paul Jazz Festival!